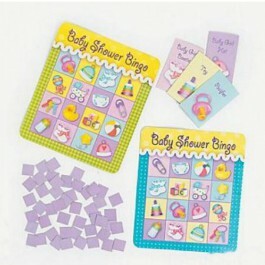 Baby Shower Bingo is a great icebreaker for your guests. Looking for a party game for your baby shower? Featuring baby blocks, rubber duckies, pacifiers and more baby favorites, this “Baby Shower Bingo” game is a great icebreaker for your guests! Includes 8 game cards, 16 calling cards and 198 bingo markers. For up to 8 players.